(a) Remove cooler thermistor No. 1. (b) Check resistance between terminals 1 and 2 of cooler thermistor No. 1 at each temperature, as shown in the chart. Even slightly touching the sensor may change the resistance value. Be sure to hold the connector of the sensor. When measuring the sensor temperature must be the same as the ambient temperature. 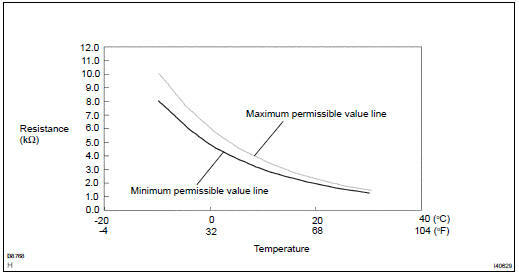 HINT: As the temperature increases, the resistance decrease (see the graph below). (a) Inspect blower switch continuity. If continuity is not as specified, replace the air conditioner control assy. Connect the positive (+) lead from the battery to terminal 2 and negative (-) lead to terminal 3 then check that the illuminations light up. If there is bulb not light up, replace the bulb. (a) Measure resistance between terminals, as shown in the chart below. If resistance is not as specified, replace the blower resistor. (a) Connect the positive (+) lead from the battery to terminal 2 and negative (-) to terminal 1, then check that the motor operation smoothly. If operation is not as specified, replace the blower motor. (a) Check that the continuity exists between each pair of terminals of heater blower motor relay assy, as shown in the chart. (b) Apply battery voltage between terminals 3 and 5. (c) Check continuity each pair of terminals, as shown the chart. If continuity is not as specified, replace the heater blower motor relay. (a) Connect the positive (+) lead from the battery to terminal and the negative (-) lead to the body ground. (b) Check that the magnetic clutch energized. If operation is not as specified, replace the magnet clutch assy. (a) Disconnect the cooler compressor assy connector. (b) Measure resistance between terminals 1 and 2 of cooler compressor assy connector. If resistance is not as specified, replace the cooler compressor assy. If continuity is not as specified, replace the magnet-clutch relay.